Gillie Club, founded in January 2002, is the name of a series of seminars and social events. The organiser, Yukihiro “Duke” Watanabe, works as a ”gillie” (a guide for fishing in Scotland) and arranges guest speakers, who give lectures about specific themes. It is a new form for theme events in small scale for those who are keenly interested, and participants can freely exchange opinions and socialise with the guest speaker. In this IT era, one can get all sorts of information and have virtual experiences on the Internet. Therefore, Gillie club offers opportunities where people can actually meet others with similar interests, have real experiences, and interact with each other. Since the start of the club 16 years ago, there have been many events with different themes and in different places, to which many people have an easy access, also in locations normally closed to the public, and as well as related business locations and restaurants, where people can actually see and experience. In Apr. 2018, we had the 1900th gillie club events. As of April 2018, 4000 people, including 1400 media people, are registered in the mailing list and receive information about events. 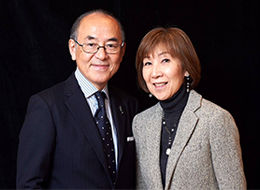 There are 450 club members, who have priority for taking part in events. Copyright(c) Gillie Company Limited. - All Rights Reserved.